According to the aficionados of so called ‘Messianic Judaism’ shortly before he died, one of Israel’s most prominent rabbis Rav Kaduri allegedly wrote the name of the Messiah on a small note which he requested would remain sealed until now. When the note was opened it revealed what many have known for centuries: Yehoshua, or Yeshua (Jesus), is the Messiah. Of course it must be true! 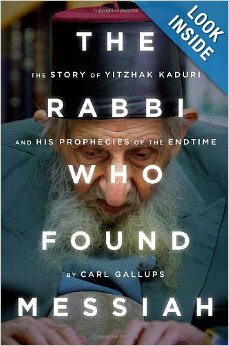 After all they even have a book about it “The Rabbi Who Found Messiah: The Story of Yitzhak Kaduri and His Prophecies of the Endtime” by Carl Gallups of Carl Gallups Ministries LLC, no less! No doubt yet another book of the me$$ianic bu$ine$$ to generate more buck$ ! Carl Gallups is not the only one peddling this type of nonsense, there are many in the ‘Messianic Judaism’ movement who are doing the rounds of posting the same regurgitated nonsense which plops out of the organs of the ‘Messianic Judaism’ movement! To question such a statement of fact even by those who were Rav Kaduri’s disciples, personal assistant and even his own son, counts for nothing as far as the authoritative, unquestionable position of the ‘Messianic Judaism’ movement is concerned! 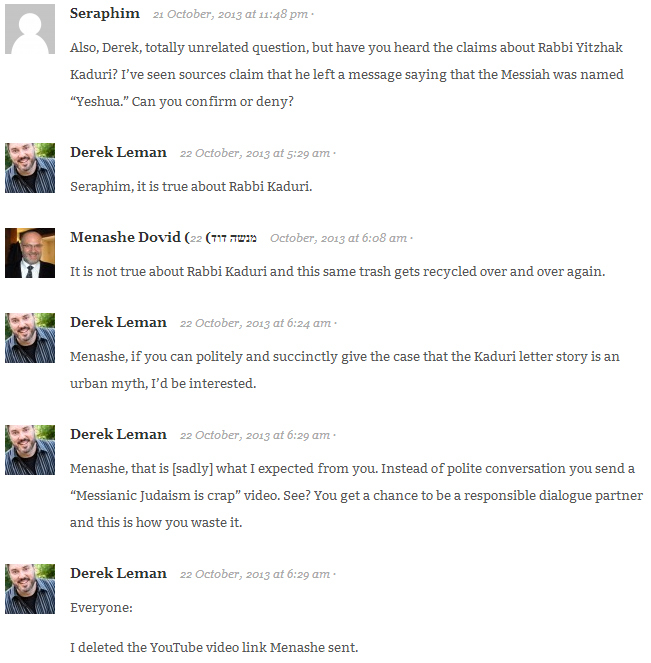 A recent video which gives a plain statement of facts from Rav Kaduri’s disciples, his personal assistant and his own son is labelled by one as an attempt of labeling ‘Messianic Judaism’ as crap! The recent video features the lies of messianic leader “Yakov Damkani” repeating the lie that Rav Kaduri wrote the name of the Messiah on a small note. How schizophrenic to give such a resounding approbation of an Orthodox Jewish Rabbi as Rav Kaduri and then in a recent post moments after the death of Rabbi Ovadiah Yosef saying those that followed Rabbi Ovadiah Yosef are incapable of being able to think for themselves! Moreover to use the Rabbis death to promote the odious lie that Yeshu is the Passover lamb too! Of course another load of garbage to plop out of the organs of the ‘Messianic Judaism’ movement is the book “The Return of the Kosher pig” (TROTKP) by self proclaimed ‘rabbi’ Shapira who in fact holds a qualification from a messianic online institution. You can evaluate the level of scholarship by an extensive review of TROTKP here. If you have a sensitive stomach to such garbage a fast track summary of the premise for TROTKP can be read here. Folks, this one must be true as Menashe has no creditable answer. Because there is no credible evidence on the part of those missionaries, mere conjecture, speculation and lies on their part. Moreover, the only way to settle would be a court case to settle the facts which are presently at best just hearsay or worst just plain lies. Let me get this straight this story about this rabbi was a lie.? The story that messianics say about Rav a Kaduri is a lie.